A blog (short for weblog) is a personal online journal that is frequently updated and intended for general public consumption. Blogs are defined by their format: a series of entries posted to a single page in reverse-chronological order. 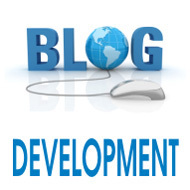 Blogs generally represent the personality of the author or reflect the purpose of the Web site that hosts the blog. Topics sometimes include brief philosophical musings, commentary on Internet and other social issues, and links to other sites the author favors, especially those that support a point being made on a post. The author of a blog is often referred to as a blogger. Many blogs syndicate their content to subscribers using RSS, a popular content distribution tool.